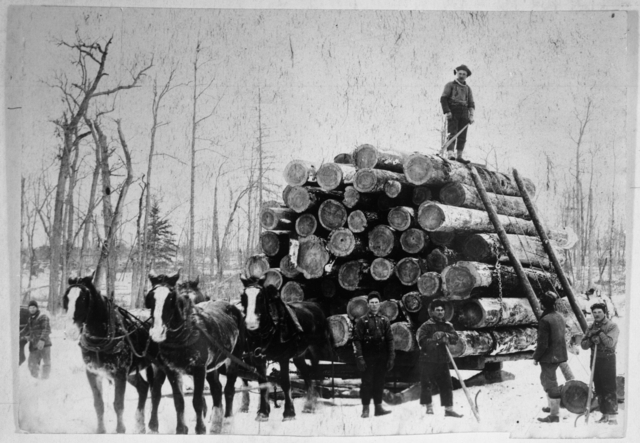 At the end of the 19th century, logging was an integral part of northern Minnesota’s economy. Although the timber industry gained substantial revenue and fueled development in various parts of the country, its reliance upon trees weighed heavily on the environment’s health. 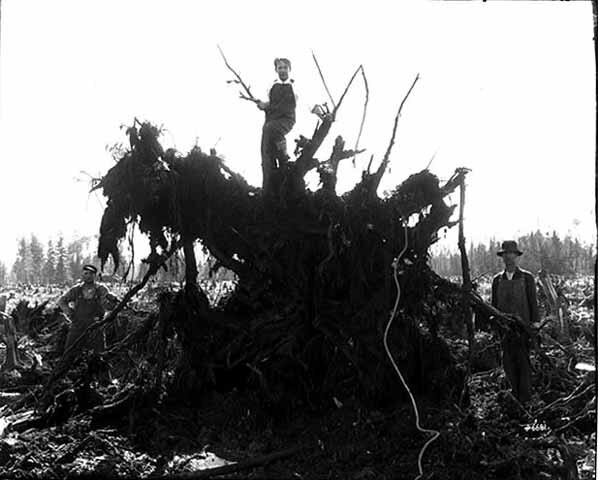 Indeed, by 1900 the annual timber harvest averaged around 2 billion board feet, indicating that this industry could provide economic prosperity to many. However, by the 1920s it was clear that regenerative properties of the forest could not keep up with the growing demands of our nation. 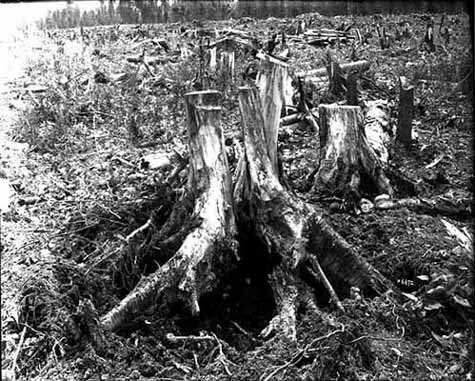 The lumber companies in the Northwoods decimated the ecosystem, transforming the forest into a vast stumpland known as the “cutover.” By 1920, the annual harvest had declined from its peak to around 576 million board feet, it had become clear that the boom and bust cycle of clearcutting could not continue provide a steady income for the inhabitants of northern and central Minnesota. With both the quality and quantity of Minnesota’s timber supply dwindling, the logging industry looked westward toward the abundant forests of the Pacific Northwest. 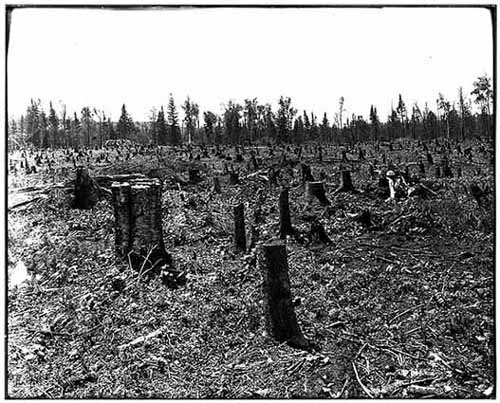 At the time there were two main alternatives to logging in the Northwoods region: farming and tourism. Although agriculture seemed promising, it took a substantial amount of work to transform the land from cutover into farmland, which required landowners to uproot countless stumps with a complex horse-drawn system of ropes and pulleys called a “stump puller.” As Frank Wethner, a farmer in Minnesota’s cutover region, reflected in an interview, this process was slow and painstaking work. He recalled that “a couple of men do well to pull a couple of stumps a day.” Coupled with the relatively rocky soil and short growing season, the stump removal process discouraged many farmers from taking up the plow in order to make a living off the land. By comparison, tourism seemed to offer an easier path to a prosperous future in a region with more than its fair share of natural amenities that beckoned to affluent residents of the Twin Cities. Charlie Kilman, Ben Pletta, and the Minnesota Environments Team, “Minnesota Northwoods: From Timber to Tourists,” Minnesota Environments, accessed April 26, 2019, http://mnenvironments.carleton.edu/items/show/16. On annual timber harvest, see Mary Hoff, “A Century for the Trees.” Minnesota Conservation Volunteer, March 2011, 14-19.